Some labels just tell you what you’re buying. This one tells the world what you’re doing. Each GoodWeave label has a unique code that can be traced back to the licensed producer. GoodWeave makes regular, unannounced inspections of all production facilities that cover tier one factories and all outsourced production, including homes, to verify compliance with this Standard. 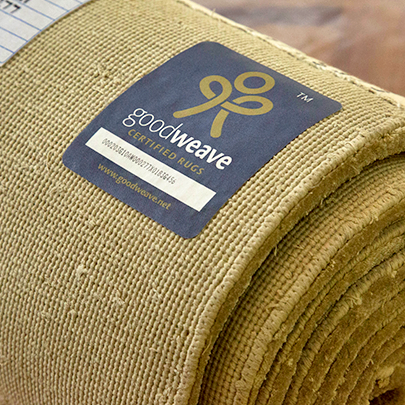 GoodWeave certification labels are issued to licensed producers selling products to licensed importers. As a full member of the ISEAL Alliance, GoodWeave complies with ISEAL’s Codes of Good Practice, which are seen as a global reference for developing credible standards. As part of this compliance, GoodWeave is independently assessed by the IOAS against the ISO 17065 standard, which ensures that the organization is free of external pressure, is transparent, has quality control, and producers are treated equally. Find a GoodWeave certified product near you. Watch Stand with Sanju and learn how you can stop child labor by buying products with the GoodWeave label.